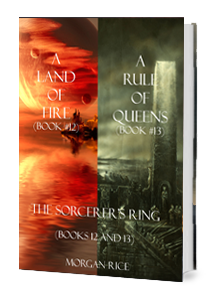 This bundle includes books #12 (A LAND OF FIRE) and #13 (A RULE OF QUEENS) in Morgan Rice’s #1 Bestselling fantasy series THE SORCERER’S RING, a 17 book epic fantasy series with over 1,000 five star reviews. The series begins with A QUEST OF HEROES, a free download! In A RULE OF QUEENS (Book #13), Gwendolyn leads the remains of her nation in exile as they sail into the hostile harbors of the Empire. Thor, determined to rescue Guwayne, continues with his Legion brothers on his quest far across the sea, to the massive caves that herald the Land of the Spirits, encountering unthinkable monsters. Darius risks it all to save the love of his life, Loti, even if he must face the Empire alone. And Volusia continues her rise, to consolidate her hold on the Empire and become the ruthless Goddess she years to be..